to companies just like yours. Discover more examples of our technology's power. Readers just like you have heard about the success our technology has brought to similar companies, then received a free demo from one of our skilled programmatic sales executives. After seeing firsthand how we can reach their goals and exceed their expectations as an ad tech partner, they became a part of our valued client pool. ...and more. Your digital advertising achievements could be added to that list. What are you waiting for? A business solutions company wanted their ads to reach hotel GMs, with a goal of achieving 5,000 conversions in 3 months. 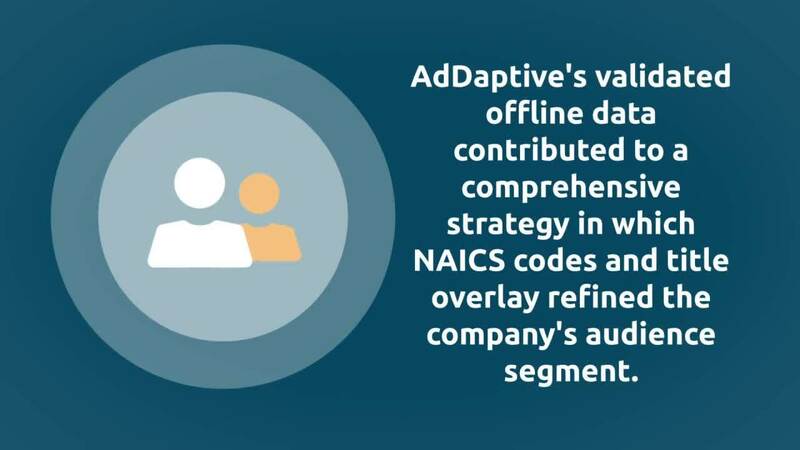 AdDaptive incorporated validated offline data into a comprehensive strategy in which NAICS codes and title overlay refined the company’s audience segment. AdDaptive’s technology delivered the client’s ads to the intended recipients successfully. In 3 months, AdDaptive delivered 3.2 million impressions, achieving a 0.11% CTR and driving 8,457 conversions. Exceeding the conversion goal by over 3k among a niche audience inspired a long-term strategic relationship. That’s the AdDaptive advantage. Book a free demo to receive a tailored preview.